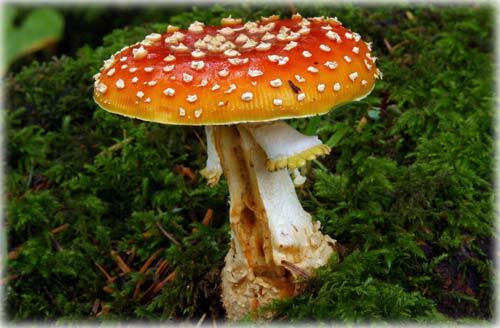 Beautiful, but poisonous, Fly Agaric mushroom; also known as a Amanita Muscaria. Photographed in the Mountain Point area. Alaska: Time is past due to open ANWR say Officials; Developing ANWR Would Create Tens of Thousands of Jobs & Raise Revenue – The U.S. House of Representatives Commitee on Natural Resources held an oversight hearing this morning on "ANWR: Jobs, Energy and Deficit Reduction". The hearing specifically examined the benefits of developing a small portion of the Arctic National Wildlife Refuge (ANWR) in Alaska as an opportunity to create new jobs and generate new revenue for the government. Responsible energy production on less than three percent of ANWR’s total land could create thousands of jobs and $150 billion or more in revenue over the life of production. Chairman Doc Hastings (R-WA) in his opening statement to the committee said, "At a time when our Nation is in desperate need of new job creation and cutting the staggering national debt, this Committee is uniquely positioned to advance solutions that accomplish both of these priorities. Responsibly harnessing America's onshore and offshore energy resources will create millions of new jobs and generate billions in new revenue." Hastings told the committee that ANWR is the single greatest opportunity for new energy production of federal land. No single energy project in American can produce more jobs and do more to reduce the debt. In her testimony, U.S. Senator Lisa Murkowski (R-Alaska) expressed her frustration over the Obama administration’s repeated attempts to lock up lands in Alaska by designating them as wilderness to prevent resource development. Murkowski made her comments Wednesday in testimony before the House Committee on Natural Resources during an oversight hearing on the Arctic National Wildlife Refuge (ANWR). The promise Murkowski is referring to is the one made by President Carter when signing the Alaska National Interest Lands Conservation Act in 1980. He stated, “100 percent of [Alaska’s] offshore areas and 95 percent of the potentially productive [onshore] oil and mineral areas will be available for exploration or for drilling.” Currently, less than one percent of federal lands onshore and none of the federal offshore lands are producing any oil or natural gas. The non-wilderness coastal plain of ANWR has a mean-estimated 10.3 billion barrels of oil. To put that in perspective, the United States imports about 2 billion barrels of oil a year from OPEC nations and is expected to import 2.7 trillion cubic feet of natural gas from all sources this year, according to the Energy Department. Also testifying today before the committee was U.S. Sen. Mark Begich (D-AK). Senator Begich reinforced his message of the need to responsibly develop the coastal plain of the Arctic National Wildlife Refuge (ANWR) as a way to create tens of thousands of jobs for Alaskans and across the country. In testimony before the House Natural Resources Committee Begich, also said developing ANWR should be part of a comprehensive energy plan that would reduce America’s dependence on foreign energy sources. On top of calling for development in ANWR, Sen. Begich offered the committee an update on efforts to drill in the Beaufort and Chukchi Seas and the National Petroleum Reserve-Alaska. Each of these opportunities would create thousands of jobs. “The University of Alaska’s Institute for Social and Economic Research estimates 54,000 jobs created from Alaskans working in the Beaufort and Chukchi Seas, including all the support and manufacturing jobs stretching from Alaska to the Lower 48,” Begich told the committee. Sen. Begich is a co-sponsor of legislation to open ANWR to responsible oil and gas development. At a time of high unemployment, high energy prices, and an urgent need to address our national debt, there is no question that this Nation needs the oil and gas that can be produced from ANWR," Representative Don Young (R-AK) told the committee. Alaska Science: Fungus Man and the start of it all By NED ROZELL - Alaskans love fungi. This was evident on a recent Saturday when author and mycologist Lawrence Millman offered a mushroom walk at Creamer’s Field on one of the wettest days of the yellow-leaf season. 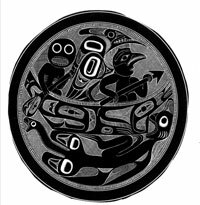 A drawing of a carving by Charles Edenshaw in the late 1800s depicting the Haida myth of the origin of women. Fungus Man is paddling the canoe with Raven in the bow in search of female genitalia. Courtesy of the Field Museum of Natural History, Chicago. And why shouldn’t it be, since Fungus Man made life possible? During a lecture at the University of Alaska Fairbanks, Millman introduced the crowd to Fungus Man, a character in a Haida myth. Millman showed a drawing depicting a wide-eyed Fungus Man paddling a canoe. Fungus Man guides Raven, who sits in the front of the canoe holding a spear. As the legend goes, Fungus Man paddled Raven the Creator to the land of female genitalia, “thus making it possible for homosapiens to appear on our beleaguered planet,” Millman said. Alaska: 2011 Permanent Fund Dividend is $1,174 - Governor Sean Parnell today announced that 647,549 eligible Alaskans will receive a 2011 Permanent Fund Dividend in the amount of $1,174. According to the Department of Revenue, 676,000 Alaskans applied for the 2011 Dividend. This represents a one percent increase over 2010 applications. • Candidates are also requested to provide a statement in which important issues facing the community are addressed and what each would like to achieve if elected.